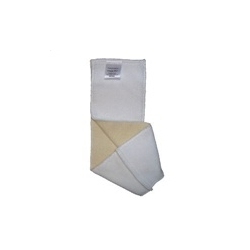 LoopyDo© Prewashed Inserts are a favorite with cloth diapering moms worldwide. Made of 2 layers of thirsty hemp french terry plus 2 layers of ultra-thick white microfiber, these inserts can really absorb a lot! Slide into the pocket of a pocket diaper. When soiled, remove from pocket and place both insert and pocket diaper into the diaper pail. Wash with your diapers or separately, whichever you prefer. Run a cold rinse first to remove soil and prevent stains from setting. Then wash in hot with 1/2 the amount of detergent recommended on the detergent package. Dry on any setting or hang to dry. A Knickernappies product made in the USA.